Hot and happening anchor turned actress Anasuya Bhardwaj is one of the finest celebrities, who always shares her personal pics and other film news on Social media. The people in Hyderabad witnessed thunderstorm last evening and the few places in the city went into darkness after the blast of 50 transformers. Some of the big hoardings in Banjara Hills lost their basement and caused a huge ruckus, and many cars have been damaged. About the incident, Anasuya Bharadwaj took to Twitter to express her views on the scary weather. “Omg!! Hearing haywire stuff abt wat da weather is doing to da city!#HyderabadStaySafe ! !,” she posted. When the fans of Anasuya enquired about her safety, Anasuya immediately said that she is safe and enjoying with her family. 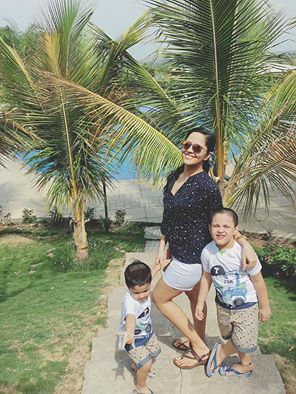 Anasuya along with above pic, posted as, “Yes yes m safe.. Out on a brief family vacation..sharing a pic if it cheers u guyz up.. #BeSafe u guyz!”.